Has it really been almost four months since my last post? Of course that’s a rhetorical question but I still want to explain why I lapsed for so long. The quick answer is I’ve been preoccupied with other activities over the past few months however at some point during that time I should have posted a quick blurb about the hiatus but I kept getting distracted. I also lost interest in all things baseball as I saw my San Francisco Giants play terribly once again this year and now that the regular season has come to a close, I’ve decided to hate-watch the NLCS. For the second year in a row, the Los Angeles Dodgers are clear favorites to win the pennant but I’m going to be rooting for the Milwaukee Brewers in the series. This petty tactic is the reason why this week’s Fresh Fitted Friday selection is a Carolina Mudcats cap as they are the Class A affiliate of the Brewers in the Carolina League. How fortuitous that I just happened to have the tags still on this cap that's over 25 years old! 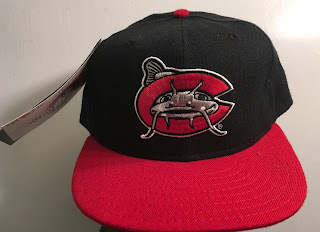 For a blog that’s largely dedicated to minor league ballcaps, it’s odd that I’ve never written about the Carolina Mudcats. This one is a legend in the sense that it was one of the earliest examples of early 1990’s teams with quirky cap logos that would go on to become classics such as the Greensboro Hornets, Hickory Crawdads and Chattanooga Lookouts. The 59Fifty sweatband tag tells me this cap is from 1993 1992 as I've seen caps that old with this tag. The loose MILB and size tags and no MILB batterman here definitely make me think this cap cannot be from after 1994 1993. We’ve seen lots of caps from 1994-96 1992-96 that feature this combination of sweatband tags however the lack of the MILB batterman reminds me of my Phoenix Firebirds and Fort Wayne Wizards caps which I believe to be from 1994 1993 due to that missing batterman.